I’m sorry…did someone say HOLOGRAPHIC? Because I am all about anything that shimmers, shines and even bears a passing resemblance to the love of my life in the 80’s – Jem and the Holograms. You heard me, I’m all about the big hair, the massive earrings and anyone whose name is Jerrica. That’s like Jessica, but with R’s! Come on now, how can you say no to that? Ok fine, maybe it needs a little toning down, but….really, only just a little! Have you heard the buzz around the SL Frees and Offers 1st Annual hunt? It’s big folks, and there are lots of fab designers participating, and loads of prizes to get your mitts on! I’m showing off the really awesome holographic sweater by Caboodle (purveyors of all things shiny). Just head on over to their store, and look around for the fall leaf that is hiding somewhere in the store. The sweater inside is completely free, has three different colour options, and comes sized for Freya, Hourglass and Maitreya bodies. While on the hunt, I also came across these fantastic shoes by Ch’s (also completely FREE!). I love the buttons up the side. Very military-inspired and completely and utterly adorable. I love them. There’s an HUD included with a boatload of colour options, and they come sized for Maitreya, Slink and Belleza feet. Good luck! Here comes the next offering from Truth! This month’s group gift is a really lovely and undone braid called Ciara. Very sweet and soft. If braids aren’t your thing, the stylist HUD has the option of turning it into a messy bun. I do love a good stylist HUD! As always, the Truth VIP hairstyle comes with a whole fatpack of colours. If you haven’t joined yet, it’s 350 L, which is extremely reasonable, and SUCH a good deal. Join the group and check in notices to pick up your own copy! Categories: Free, group gifts, hair, hunts, shirt, shoes | Tags: Aline Passiflora, Blueberry, Booty's Beauty, Caboodle, CHS, Euphoric, fab free, fabfree, fabulously free in SL, free, freebie, GingerFish, Glam Affair, hunt, JUMO, lelutka, maitreya, Minimal, Second Life, Second Life Free, Second Life Freebie, secondlife, sl, sl fashion, sl free, sl freebie, SL Frees and Offers, sl gift, sl hunt, sl style, SLF&O, SLF&O Hunt, TRUTH, Truth SL | Permalink. Good afternoon FabFree Readers! As you can see, I am a little bit unmotivated today, but I wanted to still stop in and tell you quickly about a sweet little freebie I came across! The Lyda Top I am wearing today in such gorgeous shades of plum, teal and coral is available as a free SLF&O group gift at WellMade. The SLF&O inworld group is free to join. Categories: Free, group gifts, groups, mesh, shirt | Tags: 0L, 0L free, belleza, Blueberry, Cae, Catwa, fab free, fabfree, fabulously free in SL, Foxcity, free in sl, Glam Affair, Ikon, Lost Lagoon, Love Trill, Second Life, Second Life Free, sl, sl free, SL Freebies, sl gift, sl gifts, SLF&O, TRUTH, WellMade | Permalink. I am pretty excited this year that I get to be home for Christmas. Sure, it’s a little more work to host the holidays instead of attend them, but you know what? The holidays are exhausting no matter where they are and at least I get to sleep in my own bed! I’m sure I’ll be kicking myself later when I’m up at the crack of dawn, slaving over the stove and have wrapping ribbons stuck in my hair, but for now it seems like a nice idea! There will be snow, and mistletoe and presents on the tree! You know who has a present for us? Categories: dress, Free, group gifts, mesh | Tags: 0L free, Alaskametro, Catwa, DeeTaleZ, Exile, fab free, fabfree, fabulously free in SL, free in sl, freebies sl, Glam Affair, group gift, Ikon, Love Trill, maitreya, n core, Poeme, Second Life, Second Life Free, Second Life Freebies, sl, sl free, SL Freebies, SLF&O, The Mill | Permalink. This time of year, it’s unavoidable. No matter how much of your Christmas shopping you accomplish online, there are just some things you have to go to the traditional brick and mortar stores to find. I’ve discovered a few tricks to make those times when you have to venture out a little less scary. Weekends are a no go… We may have time away from our jobs on the weekends, but hitting the stores during them is a big NO, unless of course you like crowds, long lines and getting backed into by careless drivers of electric carts. If you must venture out on the weekend, go early, VERY early to avoid the crowds. Weekdays, a big yes… If you do have a day off during the week (holidays excluded), this is a a time when you can actually browse the merch and not get bruised and battered. Late evenings… Hit the shops an hour or so before closing. The later you go, the less people you will have to fight to get to the things you want. Hopefully, these tips will spare you unwanted grief and unexpected trips to the emergency room. That’s the most important thing, really. Wear comfortable clothing. The more comfortable you feel, the more relaxed you’ll be, even in the most harrowing of situations like when a child spills a slushie down your leg… Yes, it has happened…. My outfit today is both stylish and comfortable. I found the Male Shirt Jacket at AmAzINg CrEaTiOnS as a FREE gift to members of the Third Life Group. The shirt jacket comes in 3 fitmesh sizes and standard sizes S-L and with and without the shirt underneath. The Third Life group has a one time 10L join fee. I picked up the Wasted” Skinny Jeans on one of the many group Lucky Boards at REBELLION. The jeans come with a texture HUD for four different denim colors. You need to be part of the Rebellion group to play, but joining is FREE. And I’m still wearing my new favorite, the Wagner Flat Cap, the FREE SLF&O group gift at Fe Style. 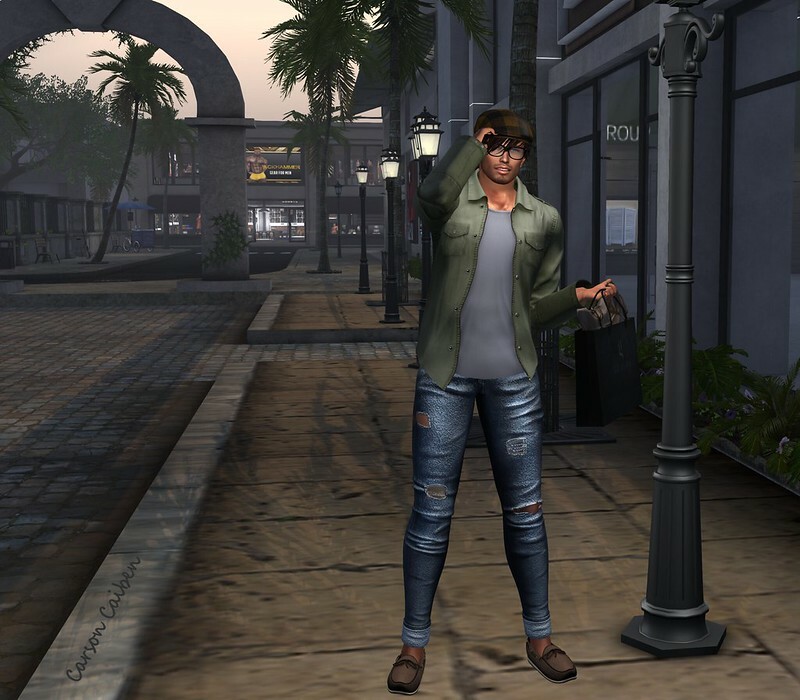 Categories: accessories, fitted mesh, Free, group gifts, just for guys, Lucky Board, mens, mesh, pants, shirt, Uncategorized | Tags: 0L, ADAM, AmAzInNg CrEaTiOnS, Carson Caiben, Catwa, Downtown, fab free, fabfree, fabulously free in SL, fashion, Fe Style, free, free fashion sl, free in sl, free sl, freebie, freebies, freebies sl, gift, gifts, Ikon, just for guys, Labyrinth, mens, Mens Where?, Nivaro, No Match, Rebellion, Reel Poses, Second Life, sl, SLF&O, Third Life, Uncategorized | Permalink. Grab the hack saw and load up the Family Truckster because it’s time to go pick out a Christmas tree. I’ve never had as much bad luck as Clark Griswold, but there have been a few times… Anyhow, at least there is a coffee stand here to warm me up before the hunt begins. It’s time to get out the hats and scarves as the temperature drops. I was lucky to come across both items for FREE! The Wagner Flat Cap is a SLF&O Group gift at Fe Style. 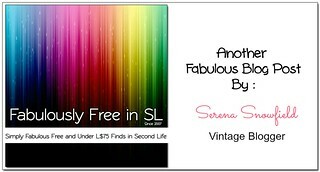 Just wear your SFL&O group tag to pick up the gift. Not a member? Just join the SFL&O group for FREE. I also picked up the Ki-Co Cozy Orange Scarf, a FREE group gift at ::K::. Now I’m warm and toasty. Don’t you just hate when you’re checking out at the store and there are all these items lined up to get a few more dollars out of you. It happened to me at Fe Style when I was picking up the cap. I found the Barho Long Sleeve Shirt on the counter by the cash register for just 10L. 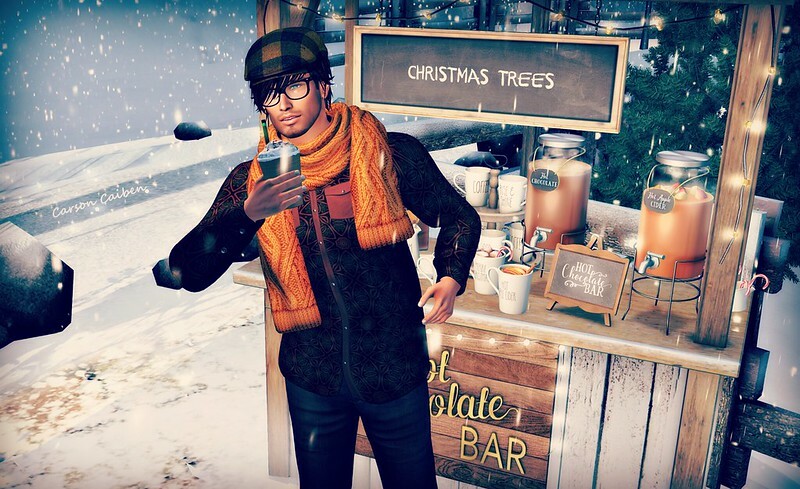 Categories: accessories, Free, group gifts, just for guys, Marketplace, mens, mesh, poses, shirt, Uncategorized | Tags: 0L, ::K::, ADAM, Carson Caiben, Catwa, fab free, fabfree, fabulously free in SL, fashion, Fe Style, free, free fashion sl, free in sl, free sl, freebie, freebies, freebies sl, gift, gifts, Ikon, just for guys, Labyrinth, Little Piggy, mens, Mens Where?, Nivaro, No Match, Second Life, sl, SLF&O, The Forest, Uncategorized | Permalink. Oh, hey there… you found me. Yeah, I’m still sitting here drinking my coffee. To be honest, I was completely unable to adult today. Sure, I had tons of stuff to do, but I didn’t get any of it done. I’ll be sorry tomorrow. But for now, I just gonna sit here quietly and enjoy my coffee. I knew I wouldn’t be getting anything done today soon as I put on this cozy outfit. The Parka Dress is the latest group gift from S@BBiA, and it comes in a one-size-fits-all mesh with an alpha layer. I love not having to make decisions – like what size to wear – early in the morning. To keep my feet toasty, I added the Baby It’s Cold Outside boots from Entice. You can pick up a pair for free by joining the SL Frees & Offers in-world group. The boots come in rigged and unrigged versions with an alpha layer so they should fit just about everyone. Categories: dress, group gifts, shoes | Tags: :[MudHoney]:, C'est la vie, Collabor88, Entice, fab free, fabfree, fabulously free in SL, Glam Affair, Jian, lelutka, Llorisen, maitreya, Mandala, oOo Studio Poses, S@BBiA, Second Life, Second Life Frees & Offers, Serena Snowfield, sl, SLF&O, Truth Hair, What Next? | Permalink. Well hi there Fabulous Readers 🙂 Just popping by to let you know that when you activate your free SLF&O group tag at Albino Peacock you can pick up a free group gift that includes two ladies fashion gifts! I actually came across these gifts when I went to slap their midnight mania board which has a lovely blue dress on it. I wasn’t lucky enough for it to lock down then, but… maybe tonight! I am showing you one of the two SLF&O group gifts today and it’s awesomely complete! The Ona Outfit includes the classy dress shown on my avatar in two denim print versions (solid as shown and pinstripe), as well as the matching handbag and shoes for Slink High Feet. Categories: accessories, dress, Free, group gifts, groups, mesh, shoes | Tags: 0L, Albino Peacock, Catwa, elua, fab free, fabfree, fabulously free in SL, free in sl, gifts SL, Glam Affair, group gift, Ikon, Love Trill, LW Poses, maitreya, Second Life, Second Life Free, Second Life Freebies, sl, sl free, SL Freebies, SLF&O, The Liaison Collaborative, The Mill, TLC | Permalink.